– Despite the well deserved misgivings about Jill Stein’s motivation for leading a recount effort whose only mathematical beneficiary would be Hillary Clinton, this is legit. I’ve consulted with fundraising experts who know the real thing when they see it, and they’re telling me that Stein really is legitimately funding recounts in Wisconsin, Michigan, and Pennsylvania, Even if Stein is just doing this to bring attention to herself and her own third party for future benefit, these recounts do happen to help Hillary Clinton. 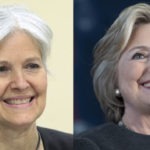 – Hillary no longer has to decide whether to file for a recount herself by any deadline, because Stein is forcing the recounts it to happen anyway. Hillary can just sit back and let the recounts happen, without having to be the one to assert that the election was rigged. – Stein has already raised enough money for the recount filing fees in all three states, which she needed to immediately come up with by the state deadlines or abandon the whole thing. Hence her original $2.5 million goal. She’s now raising money for the massive attorney fees that she’ll incur later, hence why she’s now at $5.1 million of a $7 million final goal – which it looks like she’ll reach within another day or two. In other words, all three recounts are happening. – Losing candidates cannot ask for a recount under Florida law, so there’s no sense petitioning Stein to launch a Florida recount fundraiser. The one person who can order a recount is Florida’s Secretary of State, an obscure figure whom we’re pushing into the national spotlight with a petition. Once he’s facing national pressure and the specter of it becoming a scandal if he says no, maybe he’ll say yes. But don’t count on the Florida recount happening. It’s highly unlikely. Still, you can (and should) sign the petition here. – Recounts almost certainly will happen in Wisconsin, Michigan, and Pennsylvania, and not in Florida. But if those three states all conclude that Hillary Clinton was the real winner in each, that’s the ballgame. She gets those electoral votes, which puts her over 270, and she’s President. It’s that straightforward. But it’s not likely. Even if she had 50-50 odds of winning each recount, it would only give her a 12.5% chance of winning all three. And because Donald Trump will enter all three recounts with slight leads, Hillary probably has less than a 50-50 chance of winning each. So, she has maybe a 5% chance of winning all three recounts? The only way her odds go up, and they’d go up sharply, is if the isolated instances of manually fudging the vote totals in Trump’s favor, which have already been exposed in certain precincts, turn out to have been a more widespread coordinated effort. But seriously, don’t get your hopes up. These recounts are a Hail Mary. – If Hillary were to win just one or two of the three recounts, she would get those electoral votes, but she’d still fall short of 270. However she would be much closer to 270, meaning that fewer Electors would need to go rogue and flip their vote to her. To be clear: if 270 or more Electors vote for her, she becomes President. But again, the Electoral College is another long shot. – In light of the extraordinary developments of these past few days, I’ll sum it up this way: the odds are still strongly against Hillary Clinton becoming President. If you’re rooting for Hillary (or simply rooting against Donald Trump), I would advise continuing to fight for her, but not getting your hopes up too high in the process. That said, Hillary has a better chance now than she did when the week began.